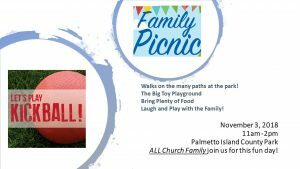 We are looking forward to the Church Wide Family Picnic Day on November 3rd at Palmetto Island County Park off Long Point Road. We will gather around 11am so feel free to enjoy your time as long as you would like at the park. There are so many things to do at Palmetto Island County Park. Plenty of paths to walk, observation deck to climb, the Big Toy Playground and plus a large grass field for us to play a big game of Kickball! We would love for you to join us as we gather together as a Family!